Despite the US military's robust budget, not every design makes it onto the battlefield. In fact, only a select number of the very best designs ever actually fly. So what the hell was the USAF thinking choosing the defect-ridden F-22 Raptor over this gorgeous jet? When the Soviets rolled out their advanced Su-27 and MiG-29 jets in the 1980s, the USAF countered with its own Advanced Tactical Fighter (ATF) competition, the winner of which would become America's fifth-generation fighter. 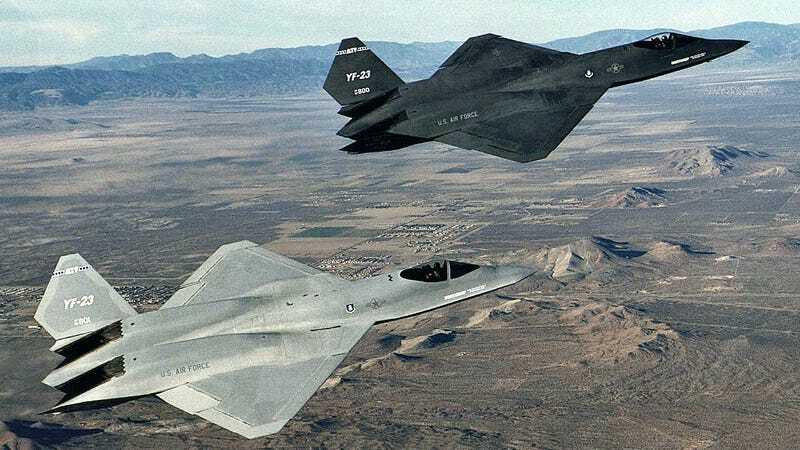 After issuing a call for designs, the Air Force chose Northrop Grumman's YF-23 prototype and Lockheed's YF-22 as the competition's finalists in 1987. Similar to the YF-22, which would become the F-22 Raptor, the YF-23 prototype was an 67-foot-long, single-seat, twin-engine design. It featured diamond-shaped wings with a 47-foot span, a thin profile to reduce drag at supersonic speeds, and a V-shaped tail. Unlike the Raptor's thrust vectoring exhaust nozzles, the YF-23 used fixed nozzles the ported out of the top of the fuselage so as to better hide the plane's IR signature from ground-based air defenses. The two prototype YF-23s, dubbed "Black Widow II" and "Gray Ghost," were powered by twin after-burning turbofans made by Pratt & Whitney and General Electric, respectively. These power-plants generated 35,000 lbf apiece, enough to reach Mach 2.2 at altitude and supercruise at Mach 1.6 for nearly 2,800 miles. And while the prototypes were never actually armed, they were designed to carry at least a 20mm Vulcan cannon, four AMRAAM medium-range air-to-air missiles, and a pair of Sidewinder short-range air-to-air missiles. Between the two ATF finalists, the the YF-23 offered greater range, faster speed, and better stealth capabilities, but was less agile than the YF-22 in combat. Conversely, the YF-23's peculiar fuselage design would have made it more expensive to produce and Northrop Grumman's program management record was far from stellar, making Lockheed's offering seem a far less risky proposition. At least that's what they thought at the time. Once the decision was made in 1991 to go with the F-22, the two YF-23 prototypes were quietly retired and shipped off to remote aviation museums, with Black Widow going to the National Museum of the United States Air Force near Dayton, Ohio and Grey Ghost heading to the Western Museum of Flight in Torrance, California. However, after 16 years of development, no small portion of which has been spent grounded due to technical failures, the F-22 Raptor is quickly losing its shine as the face of America's fifth-gen fighters. The shortcomings of the F-22 program kept the door open for the YF-23 to potentially enter production, first in the late 1980's as a replacement to the Navy's F-14 and again in 2004 as an interim bomber for the USAF. But in both cases, the YF-23 lost out to alternate designs. Today, the diamond-wing fighter seems destined for permanent retirement.